Following is a terrific paper with lots of Scripture detailing the vision of Ephraim from a Hebraic perspective from an author IN the Land. I do not yet know exactly where/how Abba is leading in this time, but feel so drawn to take a stand at this point for Ephraim and his return to the Land. Personally, my attitude of late is almost a swashbuckling swagger in terms of bringing Ephraim back together and taking a stand. 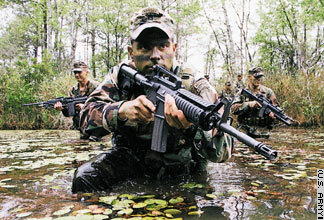 It feels much like my warrior Airborne Ranger days when we suited up to head into the bush for a mission. My attitude is definitely that of a warrior. For months I have been getting into shape and am back to military weight and nearly the same physique, though 25 years older than my heyday. But the attitude has come back. I am so ready to take a stand… not in a braggadocios way, but simply a ‘the time is NOW!’ stand. I know not what lies ahead, but Abba has definitely been awakening the warrior and molding me. Please pray for wisdom, discernment and patience. I am ready to hit the trail. (My Sunday School class got some yesterday… listen in!) No prisoners! The intensity is way up! This upcoming Congress is so at the center of my scope. It is the focus of my prayers, action and attitude. We have a mission… I can’t explain it, but feel this call. May Abba lead and guide!! torah commandments, become an integral part of the life of this dispersion. This entry was posted in A Thought... and tagged House of Ephraim, House of Israel, House of Joseph, Lost Sheep of the house of Israel, ten lost tribes. Bookmark the permalink. Thank you Brother. Read the links on your last blog and forwarded what I read on to others. Keep it alive! My whole view on prophecy has changed, its not just for looking around corners but it lets you know where you are right now! That was and outstanding post! Thank you. Indeed, we are living in very interesting times. Imagine how many throughout history only dreamed of this point in history! We are blessed to not just see it, but to participate! So glad you found this article! I have posted it at my blog, too – the passages quoted in it are exactly the passages I had been planning on writing about, so this is perfect. Thanks so much! What are your thoughts on Jeremiah 3:18? I have not checked esword yet, but the verse has played in my mind that Judah will join with the house of Israel. Does Judah seek out his brother like in the first round of Genesis or does Joseph go to his brother to seek him out? So excited for you and the mission!! Timing is an area we all need to study more. Many verses have seeming conflict, but all point to reunification. I would say we’ve accomplished a major goal if we only raise awareness among Judah and Ephraim. Action toward modern Israel began in 1896 and it took 50+ years. Modern communications and travel may significantly shorten that time span.. The old saying is that even God cant move a parked car… Trite, but illustrates the need to begin to move an let Him steer. Wow! This is the clearest and most succinct explanation I have ever come across.